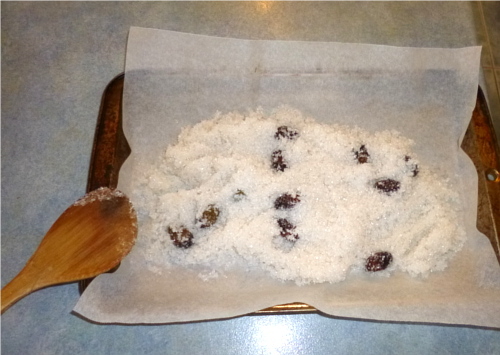 A little while back I posted about the olives that I picked from my little tree and packed in salt to cure. I left them for a few weeks longer than recommended, mostly because Husband and I were too busy and could never quite find a time to give them the proper opening ceremony they deserved. Eventually we just decided to wait until Mother's Day. Husband's parents came over for lunch. Seeing as they have a new olive tree and used a different method to cure their olives which didn't work very well, we thought they'd like to see the jar being opened. 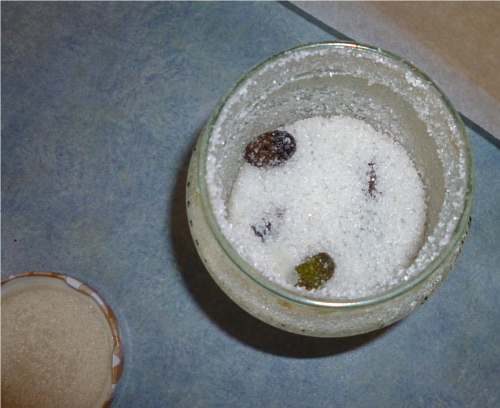 The salt in the jar was quite damp -- a good sign as its purpose is to draw out the liquid in the olives. 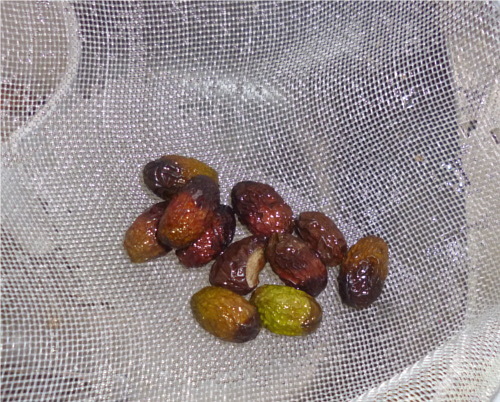 I was excited to look inside and see what happened to the olives in the last 6 weeks. We dumped out the contents onto a tray and I scooped the olives out. They were very wrinkly! I think they must have been in the salt too long and dehydrated too much. 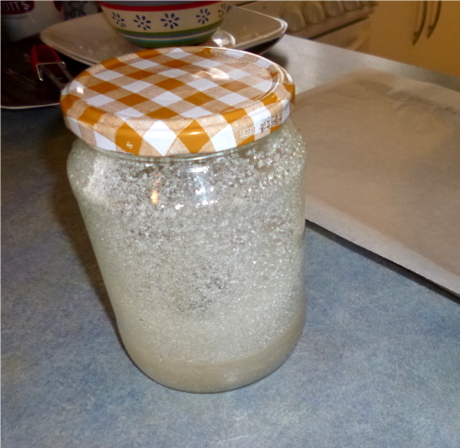 I rinsed the salt off and we each tasted one. They tasted pretty good! But Husband's parents said, wow, there's not much meat on them! We showed them the tree and they said, no, it's still too small! You're supposed to pinch the buds off the tree as soon as they appear, for the first 2 to 5 years. If you don't let the tree grow any olives, then it will put all of its energy into growing bigger, then when you finally do grow the olives, they'll be bigger and meatier. To be honest, I probably would have just let them grow anyway, as I'm too much of a softie. And too impatient to taste them! 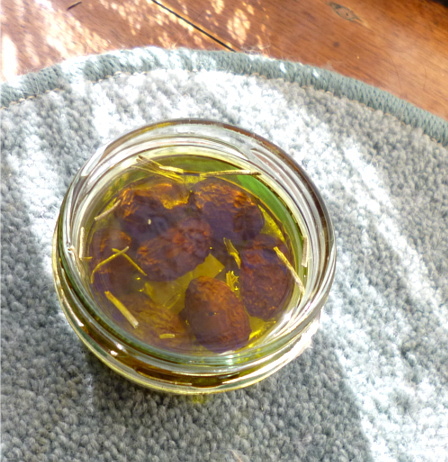 I found a teeny-tiny jam jar to put the rest of the olives in, covered them with olive oil and put in a few sprigs from our rosemary bush (that was Husband's idea). We are planning on making an antipasto platter for our Eurovision Song Contest party, so we'll probably eat them then. 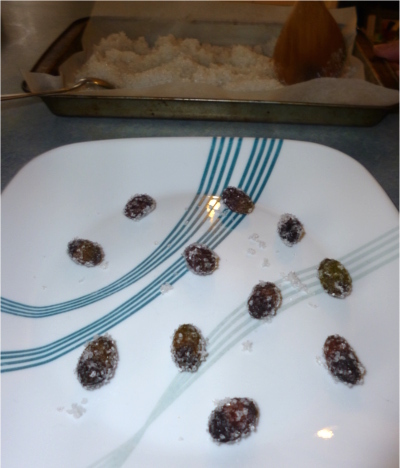 I nearly forgot to mention -- we dried out the salt that the olives were cured in. It didn't take very long in a slow oven, and now we have olive salt as well! We've used it in soups and stews and it's not bad. With the amount we have, it will definitely last longer than the olives themselves. Irony? Olive salt, what a great idea! I'm glad your curing did work our well and that they tasted good. Congratulations on your successful harvest! Thank you! I'm looking forward to watching the tree grow in the years to come.